One of the most convincing victories was completed on Sunday afternoon by probably one of the strongest Elf sides in recent memory. It took the Elf to a 13th win of the season and the first for Kolpak player Ian Chuck skippering in the absence of Rob Hewlitt. The Elf were asked to bat first and Chuck himself strode out to the middle along with Rushall 2nds Captain Andy Callaghan on debut for the Elf. Chuck and ‘Calla’ put on a very impressive opening stand seeing off both ‘Barratt’ and Duncan from the home side until Chuck lobbed one up to mid off and he was gone for 25. In doing so, the man from Natal went past 800 runs for the season, WOW. 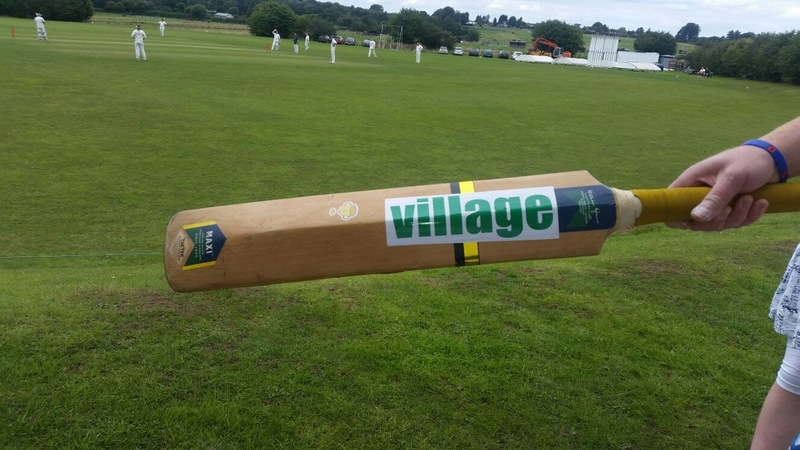 Calla was joined Alex Nunns sporting a new sticker on his bat (see pic…proper #village) and the left handers put the hosts to the sword in an impressive partnership of over 60 but Al fell on Nelson despite Chuckie telling everyone to put one leg in the air on the sideline, Nunns’ leg stump was sent flying and he trudged off after making 41 in good time. On Elf debut for the season, left handed maestro Andy Ince or the ‘Walsall Lara’ as he is affectionately known took guard and made batting looking all too easy on a deck that was just not. Shortly after notching a 50 on debut, Calla was out caught and bowled to the impressive leg spinner Highwood had on offer. Sam Stephens was in at five and he played second fiddle to Ince who was smashing the ball to all parts, Stephens quite happy to rotate the strike and allow Ince to pick up runs including a pull off one leg, reminiscent of the great BC Lara to get him past 50. Ince got a bit of a sledge at this point but the score was 198-3 at this point so, more fool them. Stephens departed just before the culmination of the innings and Gary Fitzpatrick got a red inker along with the man who holds the second best ever score for the Elf, Andy Ince finished on 63* and the Elf set an intimidating 224 for victory. Dan Armstrong (sporting a huge lump on his right leg after he ‘tried his luck’ with Sam Stephens before match) picked up ‘Yogi’ without scoring in the first over. Stephens from the other end bowled at decent pace but could not pick up wicket but kept things relatively tight until Armstrong got the other opener caught at gully by Alex Nunns before the score had reached 10. Sam then trapped Holiday in front of all three and the Elf were thinking ‘when’ not ‘if’ the victory would come their way. 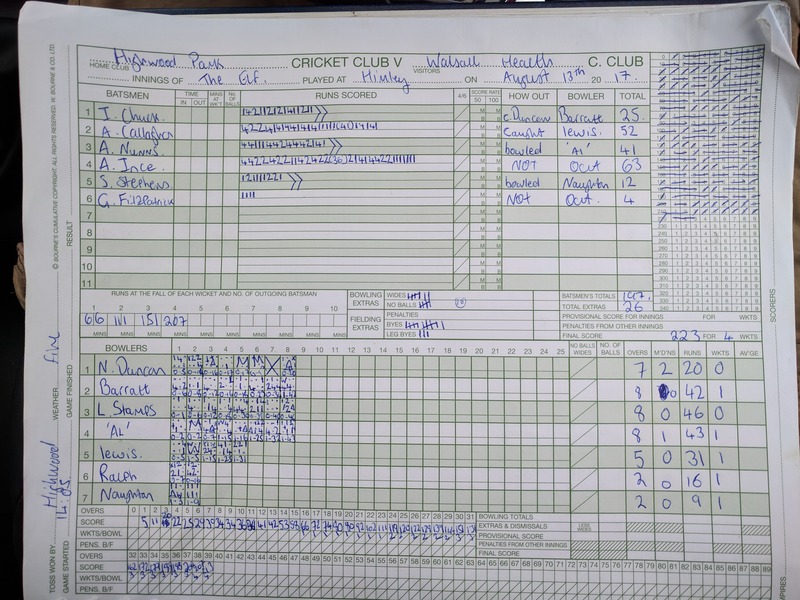 A good partnership by Barratt and Lewis saw Highwood Park put an element of respectability to their team total, some good shots on offer from the Highwood batsmen before Lewis nicked off to Armstrong and Andy Ince took a sharp catch at slip. Armstrong in his final over also got the impressive Barratt caught and bowled but could not get his fifth wicket with his final two deliveries. 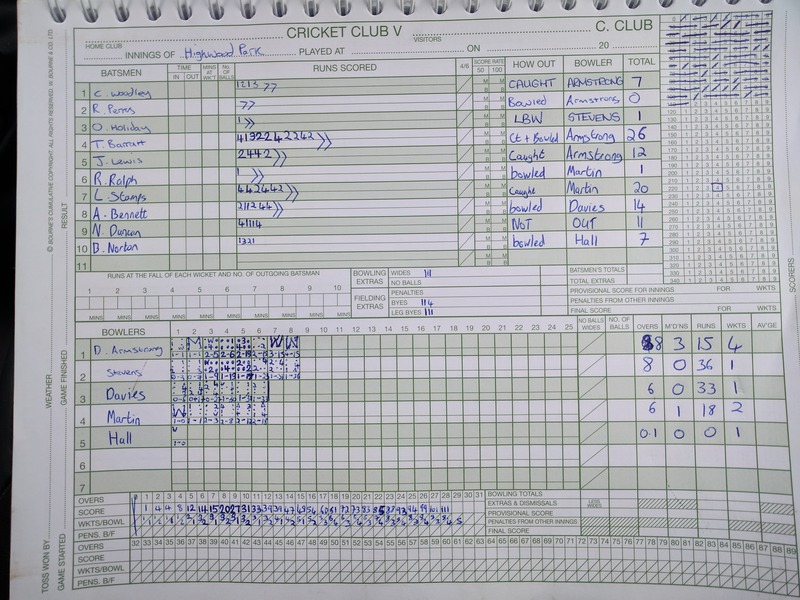 Nathan Martin was on at first change, having been away for four weeks the left arm paceman looked as though he’d never been away when he dispatched Ralph for a single. Martin also had Stamps caught at short mid wicket by Captain Chuck for a well made 20 and the Elf were on their way to a 13th win. Davies managed to pick up Bennett with one of the only good deliveries he bowled to pick up his 24th wicket of the season, surpassing last season’s total of 23. The final wicket partnership between Norton and Duncan lasted a lot longer than the Elf expected, Davies nor Martin could break them down so it was left to Elf legend Chris Hall who despite being on the receiving end of some inevitable sledging from the boundary came on and did what he does best, take wickets. His first delivery nipped back at took Norton’s off peg to the delight of his team mates. The reverse fixture will be played next week at Aldridge and the Elf will be looking to win the three match series after drawing the earlier fixture in May this year. Big spread at Himley this week. A variety of sandwiches, different types of pasta and even an expertly prepared chilli via a slow cooker for the Elf lads to dig in to. Pick of the lot had to be the chicken nuggets. Great spread, no olives though so 9/10. Only two showers at Himley but they are quite spacious and enough room for the Elf lads to soothe their aching bodies. As many as eight in for a ‘David Gower’ post game with a few lads scrambling around for shower gel, Chuckie and Tom were more than obliging to ‘pass the soap’ around. One slight grumble would be the minor electric shocks the boys were getting from the frames once they placed their hands on the shower head or holster. Not good when there’s water about. 4/10 on potential death basis. No real hills at Himley’s second pitch to speak of in this edition. The bowling side of things saw Travelator extraordinaire Chris Hall get a wicket with his first ball in the midst of some fairly village sledging from the side. Dan Armstrong bowled well but it will be extremely interesting to see how the lump on his leg shapes up in coming days as it was quite a hit from Sam. All the best to the boys in the next two fixtures, two weeks off for me now and I won’t be back until the autumn months as I’m on holiday. I’m sure whoever takes the reins will do a much better job than I in the next couple of reports. 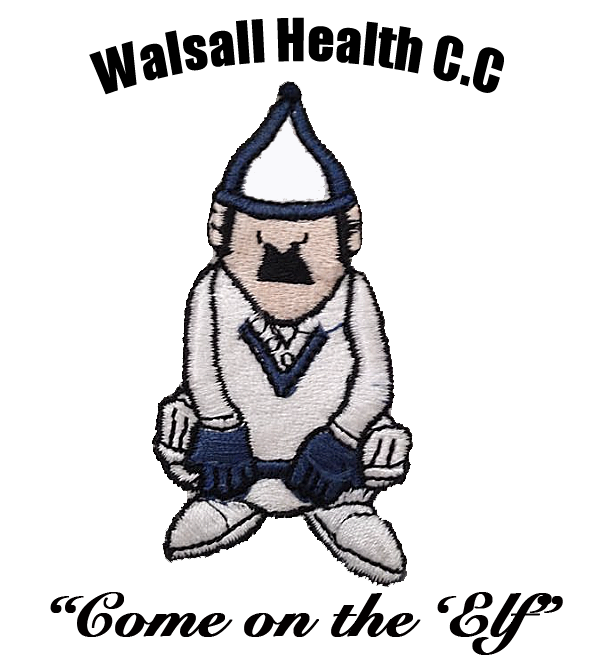 All the best to both sides for the rest of the season and as always…come on the Elf!